If you’re looking for a cheap ukulele that’s awesome for taking on the go, you’re probably looking for your very own plastic ukulele! In the past, a plastic ukulele could never be considered anything more than a toy. Just in the last year, however, plastic ukuleles have made a huge surge in popularity. This has been largely due to the emergence of 2 new ukuleles that still sound great despite being made of plastic. The Kala Makala Waterman plastic ukulele is made with high-grade polycarbonate plastic and is the most popular plastic ukulele on Amazon. Backed by the well known and respected Kala brand, this ukulele has made waves in the industry since it was released just a year ago. It’s available in a wide variety of colors (click to see one that GLOWS IN THE DARK!!! ), but we think the coolest is this clear ukulele. What’s nice about the Waterman is it has Aquila strings so it will sound great right out of the box. It’s water-resistant which makes it the perfect ukulele to take to the beach or ocean. Check out the video below of the ukulele being submerged, then playing some beautiful music! It’s also worth noting that Kala has recently given away 1,000 Waterman ukuleles to classrooms across America to help students learn music! BugsGear is a relatively new ukulele company specializing in plastic ukuleles with great sound. They’re not afraid to try new things and do whatever it takes to get the most out of their instruments. You’ll notice that the Aqulele has a large, offset sound hole for better sound projection. It’s made of highly durable ABS plastic and uses stainless steel geared tuners. Like the Waterman, this ukulele is water resistant and would be great to take to the sea, river, or pool. 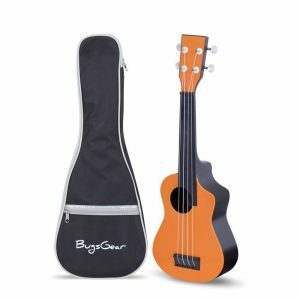 The BugsGear Travel Ukulele comes with a very nice soft gig bag for carrying your ukulele on your adventures. Kala Waterman vs BugsGear Aqulele – Which Is Better? These two ukuleles are very evenly matched! They’re both around the same price point, and equally effective around the water. 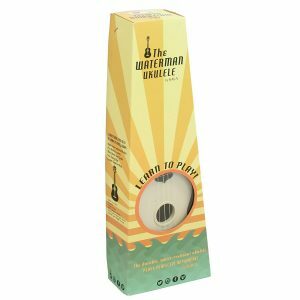 The Waterman comes with Aquila strings and comes from a well-known ukulele manufacturer, which are pretty big advantages. The BugsGear Aqulele has more internal bracing and thus is more sturdy. It also comes with a much better carrying bag, which probably makes it the better pick if you’re doing a lot of traveling. Greater durability. A ukulele made of plastic is going to be tougher and more resistant to environmental changes than a wood ukulele. A regular ukulele can be damaged by extreme temperature or humidity, whereas your plastic ukulele will be just fine. Water resistance. This is the number 1 selling point for most people who buy a plastic ukulele. The ability to take your ukulele to the beach, on a boat, or even rafting down a river is an amazing experience! You can fully submerge your plastic ukulele, dump the water out of the body, and keep on playing no problem! Inexpensive. Along with the above reasons, just how cheap a plastic ukulele is can make it a great ukulele for kids. Our featured ukuleles can typically be found for under $50! Now that you’ve heard the good, let’s take a step back and look at some of the negatives of using a plastic ukulele. Sound quality. While the BugsGear Aqulele and Kala Waterman have made huge strides forwards for the sound quality of plastic ukuleles, they just don’t sound quite as nice as a ukulele made from real wood, and it’s unlikely they ever will. Beginner unfriendly. When you’re starting out learning the ukulele, you don’t want to make things any harder than you have to. With these plastic ukuleles, it’s typically more difficult to see frets on the fretboard as they blend into the plastic. It can also be harder to see the dots on the fretboard which help you indicate the fret numbers. Whichever one you choose, the sound and performance of these ukuleles are great. If you still are having a hard time deciding between the two, don’t be afraid to simply pick the one that’s most visually appealing to you!